Obama could sue Trump for libel. Trump’s accusations against the former president could backfire. 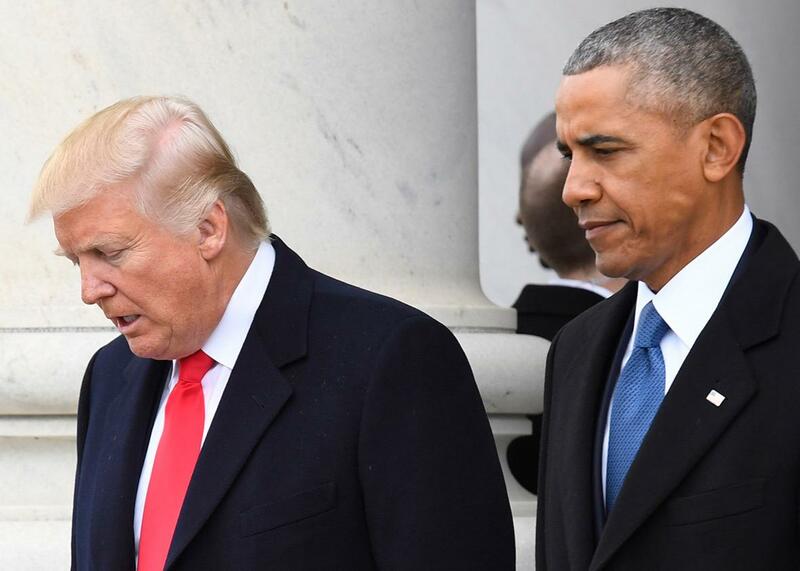 President Donald Trump and former President Barack Obama walk out prior to Obama’s departure during the 2017 presidential inauguration on Jan. 20. One of Donald Trump’s latest Twitter barrages levied an astonishing accusation against his predecessor in the Oval Office. On Saturday morning, in a furious, orthographically challenged rant, President Trump accused Barack Obama of wiretapping his phones. It seems that Trump’s tweets were based on conjecture, rather than fact, and these statements appear likely to be proven false. If anyone else had made such an incendiary claim against Obama, the former president could sue for libel. Could a good lawyer end up pursuing a case based on these tweets, albeit one against the sitting president, for libel? A suit against a sitting president would face several hurdles, but it’s not obvious that a libel claim wouldn’t succeed in this highly unusual case. If a finally fed-up 44 decided to chuck his “no drama” persona and bring a claim against 45, we could be treated to a litigation spectacle for the ages. In the 1964 case New York Times Co. v. Sullivan, however, the Supreme Court made it harder for public officials like Obama to prevail: As a result of that ruling, libel plaintiffs must now show that the defendant knew the statement was false or acted in “reckless disregard” as to whether it was true or not. Trump’s accusation that the former president illegally wiretapped him seems, from what we know so far, to have been at least reckless, even if Trump believed it to be true. Based on defamation law alone, Obama has a great case. But it’s not that simple. The office Trump holds complicates things because it gives him broad protections from civil lawsuits. If Trump had made his accusation before taking office, Supreme Court precedent has established that a libel claim would be on very sound footing. Sitting presidents, said the court, are amenable to lawsuits that don’t involve actions taken in their official capacity. In Clinton v. Jones, for example, the court held that Paula Jones’ claims against Bill Clinton stemming from alleged sexual misconduct didn’t disappear just by force of the presidency. Since most of the claims in that cases arose before Clinton became president (while he was governor of Arkansas), he couldn’t have been acting in a presidential capacity at that time. The case was sent back to the trial court for further proceedings. If Trump had sent out his tweets before taking office, Obama’s potential path to legal victory would have been well-paved even though Trump is now president. But once Trump assumed office, bringing a lawsuit against him got tougher—as it should. As the court said in 1972, in Nixon v. Fitzgerald, the president is “an easily identifiable target for civil damages.” Given the manifest complexities and challenges of the job, fairly broad immunity makes sense lest the chief executive find himself embroiled in distracting and endless litigation. With Trump in office, the question is: Were the tweets sent out in Trump’s official capacity as president? If so, he’s immune from suit. Whatever the court decides about whether a defamation claim could be brought against a sitting president, Trump’s civil liability for his words remains unclear. If, instead of tweeting out his anger at Obama, Trump had waited until the next time the two met and then punched him, it would be much more straightforward. No one would try to argue that Trump should receive immunity because committing a battery isn’t related to the president’s official duties (so far). Intentional bad acts are less likely to be protected by immunity: It’s hard to say that the defendant was acting in an official capacity when punching someone. Defamation requires intent or at least recklessness, too. Why should Trump be any more able to defame Obama than he is to punch him out? But intent is only one factor in deciding whether a presidential action falls within the scope of “official responsibilities.” Consider a 1972 case that the Supreme Court held was on the other side of the line. In Nixon v. Fitzgerald, the court found that Nixon enjoyed “absolute immunity” from a wrongful termination claim, because a president’s job necessarily involves hiring and firing. This decision makes sense. It’s too messy for a court to get into the kind of improper motive analysis that plagues employment law, and again, the president could be consumed by such cases. In this case, even an intentional bad act that could otherwise result in liability is protected—when done by the president. The defamation claim in this case lies somewhere between a punch in the nose and wrongful termination. On one hand, Trump did seem activated by rage, and it’s hard to argue that the early morning, accusatory tweet was any more related to his job than the subsequent dissing of Arnold Schwarzenegger for the cancellation of The Celebrity Apprentice. On the other, the issue of surveillance is surely related to the job. It’s possible the Supreme Court wouldn’t want to slice into that fog to determine whether the tweet gets to a real issue of national intelligence or was simply raving coming from a peeved president still in his pajamas. The easier course would be to cover the action in the blanket of immunity, especially since Obama can defend himself without a lawsuit given his high visibility. In a thoughtful piece for Bloomberg, constitutional law professor Noah Feldman finds the immunity argument more compelling than I do. If Trump can’t be sued for whipping up a false accusation against a former president, then according to Feldman, impeachment is the proper—and only—remedy if it turns out that Trump’s accusation isn’t “true or provable,” since the tweet would then amount to serious misconduct. Even if he’s right about that, there’s little chance that this Congress would bring an article of impeachment on that basis. And given the willingness of most of the GOP to overlook one outrage after the next, civil litigation might be the only available course of action against the president. Of course, the possibility of a suit also depends on whether Obama is willing to bring it. These two have paired off in another match that involved libelous statements: Trump’s birtherism claims. Obama took the high road there, and given his preternatural sang-froid, it’s quite possible he’ll do the same here. But it’s also possible he’s reached a breaking point—he’s been described as “livid” over the accusation that he committed a felony. If Obama does bring a case, it doesn’t help Trump’s cause that he’s tried to bully an entire branch of government. The recent spat that resulted from the judicial branch’s pushback against the immigration ban is a reminder that the courts are still functioning and that “so-called judges” aren’t afraid to go where the law takes them. In a suitably outrageous case like this, an award for damages might be the final destination. Trump, who complained during the campaign about how tough it was to win a libel suit, may end up being saved by those same high barriers. Part of Trump’s appeal has been the demystification and deconstruction of the presidency. And as we’ve learned, despite even his supporters’ wishes, there is no other, more presidential Trump. His tweets are the most visible manifestation of his impulses: generated from a personal Twitter account and shockingly unmediated. It would be fitting if his tendency to collapse his personal and professional sides cost him the immunity he might otherwise have been able to claim.